As a young seminarian in the 1960s, the Rev. Robert Rosebrough marched for civil rights. For most of his 46 years as a priest, he has worked in inner-city parishes. His parish, Blessed Teresa of Calcutta is in Ferguson, Mo., a short distance from where a white police officer shot an unarmed African American teenager last August. The shooting sparked weeks of sometimes violent protests and exposed a wide divide between the community, which is largely African American, and its police force, which is overwhelmingly white. Violence erupted once again in Ferguson as the city learned of the grand jury decision not to indict Officer Darren Wilson in the killing of Michael Brown. Many were anticipating the worst. Governor Jay Nixon declared a state of emergency and activated the National Guard on Nov. 17. Since Brown’s death, “Father Rosy,” as he is known, has been a prominent pastoral voice in that troubled city. “It’s time to complete what the civil rights movement started,” Father Rosebrough says. The protests that rocked Ferguson do not reflect just one city’s problems, he says. Nor were they about a single shooting. “Ferguson’s problems are about changing a culture of violence in America,” Father Rosebrough says. In the time since Brown died, there have been more than a hundred shootings in St. Louis County, including an incident in which a 19-year-old was gunned down outside the day care center his mother operates. Some of the violence was gang-related. Some of it was random, according to Father Rosebrough. Father Rosebrough, who is 71, began that call with prayer. His parish of 950 families is a few miles from where Brown was killed. After public protests turned violent, he and his parishioners started praying the rosary daily at a grotto dedicated to the Virgin Mary outside the church. He says they prayed for Ferguson’s police, protestors and public officials—in short, for healing. 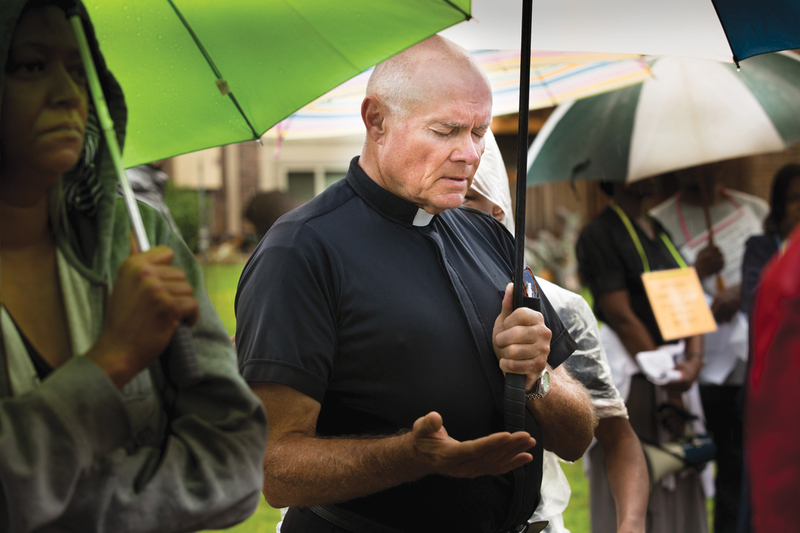 Singing, “It’s me, O Lord, standing in the need of prayer,” Father Rosebrough led a prayer procession earlier this month from Blessed Teresa of Calcutta parish to Ferguson’s City Hall. It drew 250 people, including the mayor. “It was a peaceful protest, so the only coverage we received was in the Archdiocese of St. Louis magazine,” he laments. “Lean In” will provide a structure for blacks and whites, police and community members, to meet, socialize and discuss issues together on a regular basis, Father Rosebrough says. “It’s a way of inviting people to have their stories told. “One of our parishioners said, ‘Why did it take Michael Brown’s death to make this happen?’ All of us are guilty of not seeing things sooner,” he says. My comments are directed at the author of this column,Judy Valente. The actions of Reverend Rosebrough I applaud, especially his efforts at prayer and open discussions within the community and beyond. But discussions can only be beneficial if the facts are frankly presented by all sides. Start with the fact that this incident was initiated by the actions of Mr. Brown. If an assault had not not been made by him at the store there would not have been an encounter with officer Wilson. The statement that "an unarmed African American teenager" was shot implies something else. Also the fact that the police force is "overwhelmingly white" implies that this was a racial incident and not a criminal incident. Racism does exist cross the country.within many groups.. It needs to be addressed. Knowing the weakness of man we can only hope and prayer that it will decrease. The framing of this article does not promote progress in this area.. This article also appeared in print, under the headline "Working for Peace in Ferguson As Violence Erupts Anew," in the December 8-15, 2014 issue. The author is America’s Chicago correspondent.